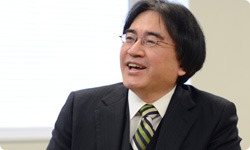 (Editor's note: This “Iwata Asks” interview was carried out with the help of an interpreter. All statements originally in English have been translated into Japanese. 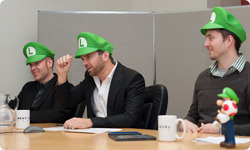 (looking at the Next Level Games staff on a video-conference monitor) Thank you for wearing Luigi hats! Today’s interview is about Luigi’s Mansion 2. First of all, thank you for the long time you spent on development. I thought you would be able to take it easy by the Christmas season of 2012, but it ended up taking until 2013. You’re all smiles now, but the end of last year was really hard, wasn’t it? But thanks to your hard work, the content turned out to be worthy of a product produced by Miyamoto-san. Thank you. I’m very proud of what we accomplished in the last few months. I’d like you to introduce yourselves, starting with Next Level Games1.1. Next Level Games Inc.: A videogame developer located in Vancouver, Canada, founded in 2002. This company has been involved in development of games such as the Mario Strikers series and Punch-Out!! I’m Bryce Holliday. I was game director of Luigi’s Mansion 2. I’m Chad York. I was audio director of Luigi’s Mansion 2. Audio is a very important element of games in this genre. I’m Brian Davis. I was involved as gameplay programmer. I was in charge of developing the spider boss, stairway boss and so forth. It’s a great honour for me to be here today. 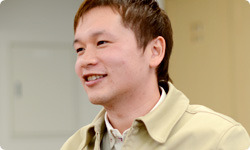 I’m Ikebata from the Software Planning and Development Department. I was involved with this title as supervisor. 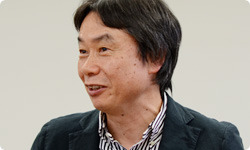 I thought about the game’s content and specifications together with Bryce-san and the others in Canada, reported progress to Miyamoto-san regularly, and conveyed the results back to Next Level Games. Ikebata-san, while you were taking on duties close to that of a director, you were also the liaison to Miyamoto-san. Miyamoto-san, I suppose you don’t need to introduce yourself. I’ve produced a variety of products. But this time was a little special. I was involved first as an original creator of Luigi’s Mansion2, and then indirectly for a long time as a guardian of the directors’ team by talking with Ikebata-san once every two weeks, so it was a very unusual style of production. I was a guardian in the sense that the guys doing the hands-on development were basically in charge of the creative work and I wasn’t directly in charge.2. Luigi’s Mansion: An action-adventure game released simultaneously with the Nintendo GameCube console in May 2002. But to us, you were the best coach. You produced in the form of a mentor this time? What do you mean by “in the form of a mentor”? A mentor can mean a guide, or a teacher. 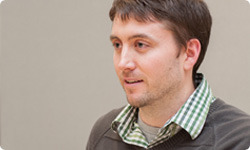 I think that to the hands-on development staff, you were sort of a spiritual teacher. I wasn’t anything that cool! I suppose I was like a shepherd. Right. That way they wouldn’t do anything unnecessary and almost all the work they did would lead to the final result. Sometimes, we wanted to graze freely (laughs), but I think he did a good job leading us. They raced along for over three years and it all went into the finished product. Indeed, the development phase for this project was very long. Yes, it was long. We’ve been involved with this title since 2009, so it’s been a little over three years. Congratulations! (laughs) You say it took over three years, but that doesn’t mean you got off-course, does it? No. I feel like it passed by in a flash. Even though it took three years, it went by in a flash? Yes. That’s how intense it was. Your shepherd provided good guidance, so development never lacked focus. What was your impression at Next Level Games when you first heard about this project? At the time, we were actually involved with a completely different project for Nintendo, and one day we had a video conference about that. We had made a prototype in preparation for that meeting. And Kensuke Tanabe-san3 suddenly started something like a drumroll and said, “You’re going to make Luigi’s Mansion 2!” I was so surprised I could barely speak.3. Kensuke Tanabe: Executive Officer, Software Planning and Development Department, Software Planning and Development Division. 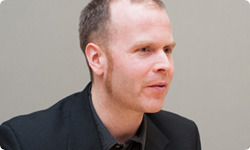 He has worked on such games as the Metroid Prime series (Nintendo GameCube, Wii) and Donkey Kong Country Returns (Wii). 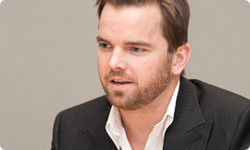 In the past, he has appeared in sessions of “Iwata Asks” covering Donkey Kong Country Returns and Paper Mario: Sticker Star. Everyone was incredibly excited. I had been involved with the audio for the Mario Strikers series4 and Punch-Out! !5, but Luigi’s Mansion isn’t a sports game like those, so I thought, “I can make all kinds of music!” I was so happy I was in seventh heaven!4. Mario Strikers: The first game in the series was Mario Smash Football, released for Nintendo GameCube in November 2005. The sequel was Mario Strikers Charged Football, a fighting football game released for the Wii console in May 2007.5. Punch-Out!! : A boxing game released for the Wii console in May 2009. I’ve been playing Nintendo games forever, and I love Luigi’s Mansion so much that I even brought the Nintendo GameCube software with me today. I remember how thrilled I was to become involved with the sequel and have my experience and knowledge up to that point play a role in it.